"Department of Surgery Launches Opioid Reduction Initiative"
In August 2018, the Department of Surgery rolled out an Opioid Toolkit (on screen) with recommendations for responsible post-operative pain management. 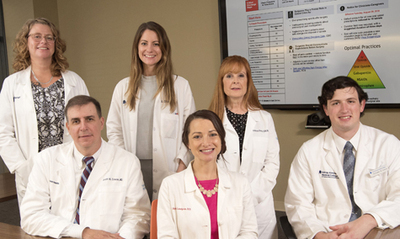 The development team includes, (standing) Christine Schleider, RN, BSN, CNOR, Adrienne Christopher, MD (PGY2), Kathleen Shindle, RN, BSN, CCDS, CDIP, and (seated) Scott Cowan, MD, Megan Lundgren, MD (PGY4), and Christopher Kustera (MS2). Fourth year general surgery resident Megan Lundgren, MD, and a team of researchers led by Scott Cowan, MD, FACS, Vice Chair for Quality for the Department of Surgery, initiated a project aimed at examining Jefferson’s opioid prescribing practices in the perioperative period. The team surveyed more than 400 patients who had undergone general surgery procedures at Thomas Jefferson University Hospital. After identifying how many opioids each had been prescribed, they interviewed patients to understand how many they actually took, how many pills were left over and how the leftover pills were being stored and/or disposed of. Using this data, Dr. Lundgren and the team performed an analysis to determine the ideal number of pills to prescribe in the postoperative period. The output of that analysis is the Opioid Toolkit for the Department of Surgery. Rolled out in August 2018, this online resource educates providers by explaining the reasons why surgeons play a role in the crisis. Importantly, providers are encouraged to set expectations during preop appointments in terms of number of postoperative opioids that will be prescribed and the use of non-opioid alternatives to control pain. The Toolkit promotes a pain management spectrum that supports the use of acetaminophen, NSAIDs and Gabapentin as first and second line options. Oral opioids and IV opioids are positioned as last-resort options, with specific dosing instructions for each type of procedure. The Toolkit was introduced to the Department of Surgery by Dr. Lundgren at a recent mini-Grand Rounds presentation and is currently available on the Jefferson Intranet. (2018) "Department of Surgery Launches Opioid Reduction Initiative," Jefferson Surgical Solutions: Vol. 13 : Iss. 2 , Article 5.